No one really knows the environmental ramifications of scrapping hundreds of thousands of cheating diesel Volkswagens. That’s scary in and of itself. But the sheer scale of what’s going on is hard to imagine, and while you’ve probably seen still shots of the various places where those hordes of VWs are parked, this drone video drives the point home better than any photo can. 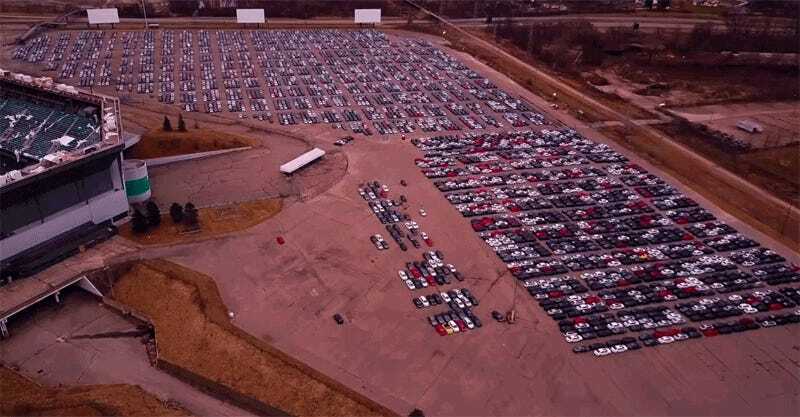 The video comes to us from Michigan’s abandoned Pontiac Silverdome, once the home of the Detroit Lions and now the home of hundreds—thousands?—of parked Volkswagens. This shooter flew a drone overhead to capture it all. Each of those was someone’s car once. Goddamn. It’s worth nothing that the Silverdome is just one such site across the country where the cheating VWs sit, awaiting their fate, whatever that may be. We at Jalopnik know of at least four or five other sites and there are almost certainly more. So multiply what you’re seeing here by four, five, six or more and you start to get a grasp on what’s really going on. It’s nuts to think about.